July 20, 2015 -The big news is that two major hotel waterpark resorts, Kalahari Waterpark Resort and Camelback Mountain Resort, have opened in the Pocono Mountains, giving new life to the familiar destination. Hotel developers and waterpark lovers alike are watching for the excitement to unfold this year — as brand names, like Lego, Nashville, Dollywood, Schlitterbahn, Kalahari, Courtyard and Norwegian Cruise Lines open new properties and add to existing ones. New hotel waterpark construction is upward bound. Twenty-seven hotel waterpark resorts are estimated to open in 2016. Kalahari Waterpark Resort in Pocono Manor PA opened in July 2015 with 457 rooms, 3 restaurants, an 87,000 sf outdoor waterpark, a 100,000 sf indoor waterpark, a 65,000 sf convention center, a 10,000 sf spa and a 30,000 sf family entertainment center that includes 6 lanes of bowling and miniature golf. The $350 million 150-acre project completed the first of two construction phases. The second phase, scheduled for completion in 2016, will add another 500 hotel rooms and add 100,000 sf to the indoor waterpark. The resort is African-themed just like the first two Kalahari Resorts in Wisconsin Dells WI and Sandusky OH, Owner and CEO Todd Nelson traveled with his family, and a small film crew, to Africa to explore the area and purchase furniture to give the resort an authentic look and feel. Package room rates start at $200 to $300 with admission to the waterpark included in the price. While the Poconos supply of hotel waterpark resorts is expanding, the destination is still under-served due to the heavy population in the New York City, New Jersey and Philadelphia markets. The new lure of the Poconos is undeniable according to Nelson. The region attracts 25 million visitors each year, with over 90% coming for leisure, generating 33,700 jobs, $1.2 billion in labor income and about $300 million in state and local taxes. For more, call 877-525-2427 or go to www.kalahariresorts.com/pennsylvania. Camelback Mountain Resort in Tannersville PA, already a successful ski resort in the Pocono Mountains, opened a 453-room hotel with conference center and a 134,000 sf indoor waterpark in April — adopting the four-season strategy by offering recreation and entertainment for all ages year round. For more, talk to owners Art Berry and Ken Ellis. The management team is headed by Pete Helland, who owns and manages the Wilderness Resort in Wisconsin Dells. Call 570-629-1661 or go to www.skicamelback.com. Westgate Towers Resort opened a new indoor waterpark in Kissimmee FL in June. Westgate Town Center & Spa added a 39,000 sf indoor waterpark in Orlando FL in June. The park features a pirate ship, water slides, a lazy river, a children’s play area, 16 private cabanas and a steakhouse. For more, talk to ceo David Siegel of Westgate Resorts based in Orlando. In June, Schlitterbahn Hotel Waterpark in Corpus Christi TX opened their river system, which surrounds their Padre Island waterpark. What’s Opening in the Second Half of 2015? 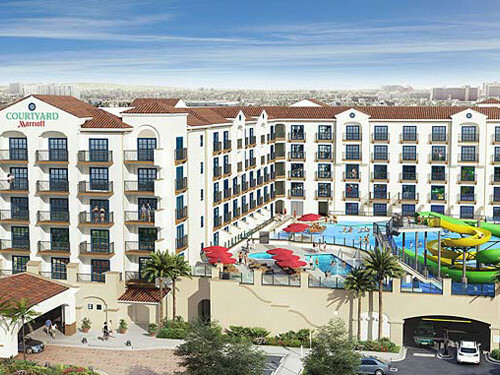 Courtyard Anaheim Waterpark Hotel opened in July 2015 with 221 rooms and the 20,000 sf Surfside Waterpark. The hotel is directly across the street from Disneyland. The rooms are extra big (530sf), sleep six, feature bunk beds and provide two showers. Surfside Waterpark is located atop a 20,000 sf observation deck where you can enjoy 6 waterslides, a 400 gallon dump bucket, water cannons, swimming pool, children’s pool, hot tub and a view of the Disneyland fireworks. There’s the Bistro for breakfast, Starbucks coffee bar, outdoor café, a fitness center and free Wi-Fi throughout. For more, call 714-254-1442. What Opened in the First Half of 2015? Blue Harbor Resort in Sheboygan WI added The Riptide, a double-wide indoor surfing ride called the Flowrider. The new ride not only extends the surfing season amid 84-degrees year round, it allows the indoor waterpark resort to attract teens in addition to the younger middle-school generation, according to David Sanderson, general manager. Legoland Florida Added a New 152-Room Hotel to its water ski theme park in Winter Haven FL in May. The expanded waterpark features a new 5-foot deep wave pool, 2 enclosed slides, 3 speed slides, playground, tipping bucket, lazy river, toddler pool, grille and surf shop. For more, go to www.legolandhotel.com. Nashville Shores Added a $2 million Raft Ride, Treetop Tours, Cabins & RV Park which opened to the public in May 2015. The Big Kahuna is a 57-foot-tall, 530-foot-long 4-passenger family raft waterslide. Owner Kieran Burke has doubled the size of the park with a treetop adventure area, 20 lakeside cabins, an 84-unit RV park, wave pool, lazy river, giant water treehouse and a spray ground. Nashville Shores has 104 lodging units. For more, go to www.nashvilleshores.com. Splashway Waterpark Added a 6-foot-deep, 30,000 sf Wave Pool to its outdoor waterpark in Sheridan TX — which opened in May. Splashway is an 80-acre RV Park & Campground with tent sites, cabins and cottages. For fun, there’s 8 ziplines that run 70-feet high over 4,000 feet of cable. For more, visitwww.splashwaywaterpark.com. Rippin Rapids Resort in Rapid City SD is opened in June 2015. The resort features a Waterpark & Adventure Sports Center. Of 93,000 sf total space, more than 77,000 sf is indoors — providing year-round surfing on a SurfStream standing wave and a PerfectSwell moving wave created by American Wave Machine. The indoor waterpark and adventure center also include 3 waterslides, a lazy river, a ropes course, rock climbing wall, ziplines racquet ball courts, massage salon and 7 retail spaces. Rippin Rapids opened at East Mall Drive next to the 100-room Hilton Garden Inn with everything under one roof. For more, visit www.rippinrapids.com. The Dollywood Company of Pigeon Forge TN consists of the 150-acre Dollywood theme park, the 35-acre Dollywood Splash Country outdoor waterpark, Dollywood Cabins and the new Dollywood DreamMore Resort, which opened its 307 rooms in June 2015. The nearly 4,000 sf resort pool meanders through a lush pool deck. At one end is a gentle waterfall just outside the lobby’s 3-story windows. On the other end is a zero-entry swimming pool that slopes just like a natural pond or lake. Best of all, the resort is next door to the theme park and the waterpark. For more, go to www.dreammoreresort.com or visit www.dollywood.com. The Town of Blaineville, part of Greater Montreal, Quebec, Canada, has acquired the 900,000 sf of land it needed to construct its $40 million Aquapolis Indoor Waterpark. About 100,000 sf is being used for the indoor section of the waterpark and another 30,000 sf is being used for the outdoor waterpark. The building will cost $11 million and the equipment will cost $29 million. The remaining space is designed for green parks, parking and 4 to 5 hotels. The Divco Group, Rosdev and Capital Liason are backing the project as investors. Aquapolis will have a 2,500 person capacity, which translates into about 500,000 visitors annually, with ticket prices for the day costing around $27. Aquapolis is scheduled to open in November 2015. In Cancun, Quintana Roo, Mexico, the 155-room All Ritmo Resort & Waterpark opened in March with a 20,000 sf outdoor waterpark. Diamond Hotels & Resorts is the developer. For more, call 809-221-2121. As we see it, there are no hotel waterpark resorts in the Caribbean that are under construction and opening in 2015. Grand Springs Resort & Waterpark at Polaris Pointe Mall, Colorado Springs CO.
American Dream Hotel & Waterpark Phase 1 & 2, Meadowlands NJ. Revel Waterpark Casino, Atlantic City NJ. Royal Caribbean’s Harmony of the Seas, Port Everglades FL.